Gary is the first General Manager of the Tucson Rodeo. A native Tucsonan, he graduated from Rincon High School. He earned a business degree from the University of Arizona, but his love of being a cowboy and the rodeo kept him in Tucson. He started attending rodeo as a child because his dad played in a Western band that performed during the rodeo. This love for the sport resulted in Gary becoming a bull rider. He rode bulls for 16 years, followed by being a rodeo clown for three years. In 1987 he became a member of the Tucson Rodeo Committee, a volunteer organization for which he worked as chairman of the publicity and promotion committee. He eventually became vice chairman of the committee and then chairman of the Tucson Rodeo Committee. During the time he was volunteering with the Rodeo Committee, he was director of human resources at the Arizona-Sonoran Desert Museum. 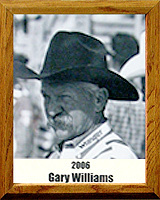 In 1996, after 71 years, the Tucson Rodeo Committee hired Gary as its first paid employee and its first general manager. As GM he is responsible for the overall everyday operations that includes securing sponsors, enlisting cowboy athletes to participate and putting on the biggest sporting event in all of Southern Arizona. While responsible for taking the rodeo forward into the 21st century, Gary is true to its historical roots and respects the traditions that it has had for more than three-quarters of a century.